the effacement of educational experience by standardized testing. A cosmopolitan curriculum, Pinar argues, juxtaposes the abstract and the concrete, the collective and the individual: history and biography, politics and art, public service and private passion. Such a curriculum provides passages between the subjective and the social, and in so doing, engenders that worldliness a cosmopolitan education invites. Such worldliness is vividly discernible in the lives of three heroic individuals: Jane Addams (1860-1935), Laura Bragg (1881-1978), and Pier Paolo Pasolini (1922-1975). What these disparate individuals demonstrate is the centrality of subjectivity in the cultivation of cosmopolitanism. Subjectivity takes form in the world, and the world is itself reconstructed by subjectivity’s engagement with it. 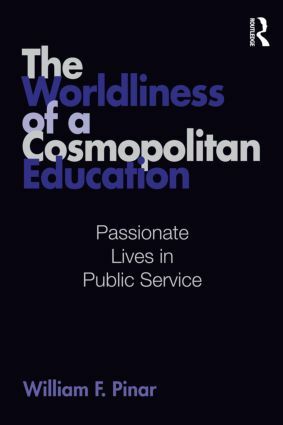 In this intriguing, thought-provoking, and nuanced work, Pinar outlines a cosmopolitan curriculum focused on passionate lives in public service, providing one set of answers to how the field accepts and attends to the inextricably interwoven relations among intellectual rigor, scholarly erudition, and intense but variegated engagement with the world.